It’s Thanksgiving, so let’s talk about pie crust, y’all. I started making pie crust with my grandma – affectionately called Yakima Grandma, because, well, she lives in Yakima, WA. 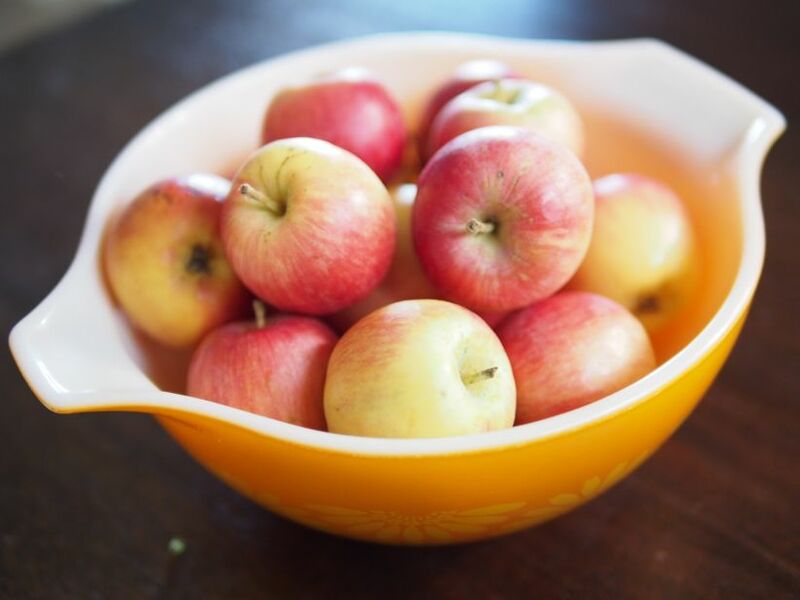 Yakima is in the agricultural heart of Washington state, so I grew up making apple, peach, and other fruit pies with her. We always used a shortening-based crust. That’s just how I learned. I remember the finesse with which she moved her hands and manipulated the dough, and how perfect the pie came out – every freaking time. As I got into cooking myself, I became attracted to the science-based work of Alton Brown and Harold McGee, and eventually, Rose Levy Beranbaum. I think actually Shuna Lydon first led me to Beranbaum, but I’ve never looked back. I’ve got at least two of her cookbooks, and my copy of The Pie and Pastry Bible is well-worn and commonly spotted on the counter. I can’t get enough of it. She really knows the hows and whys of flour and all the great things you can do with it. And her pie crust recipe works for me, every time. It’s specific, hoo boy, but if you follow it, the payoff is great. I’ll re-post her recipe here, with some details, tips, and tricks to guide you through the process. This recipe does require a food processor. I’ve tried to do without, in a pinch, and it really just doesn’t work the same. If you don’t have a food processor, stick with whatever recipe is working for you so far! A note on ingredients: there are only 7 ingredients in this recipe, which means each one counts. You should get the best of each one that you can manage, but definitely buy the absolute best butter, heavy cream, and cream cheese you can find and afford. The better taste will reward you in the final product, I promise. 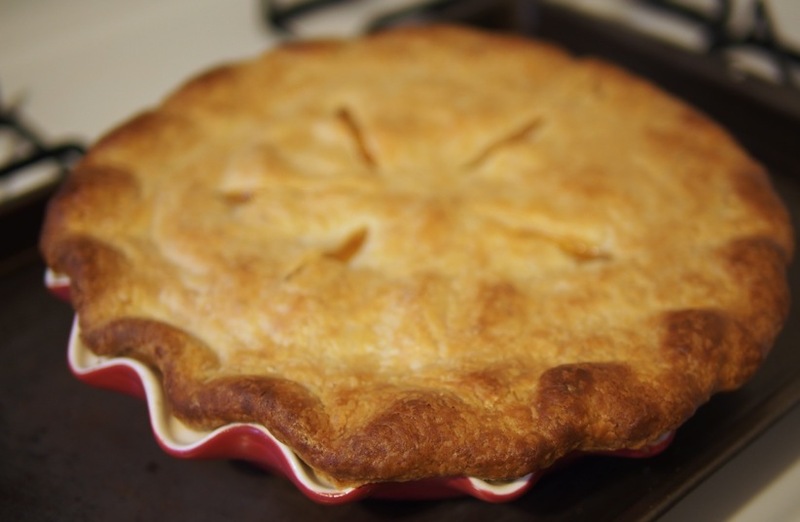 A note about the coldness: It’s your pie crust’s best friend and the secret to all your success here. The ingredients really do need to be as cold as possible. 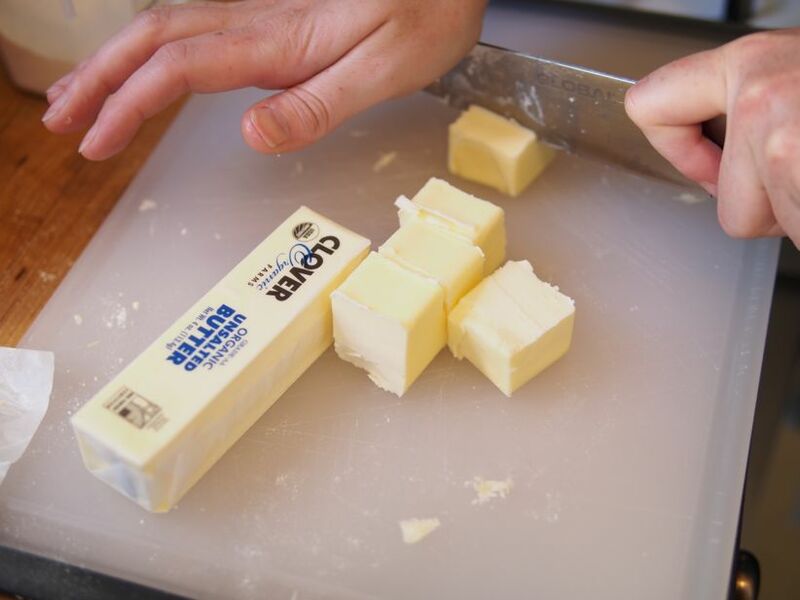 Start by slicing your butter into cubes, then put the cubes on a small plate and freeze them for about 20 minutes. Make sure your heavy cream and cream cheese are coming straight from the refrigerator. As for your pastry flour, I just keep a small bag in the freezer for pie crust time. It’s easy and convenient. 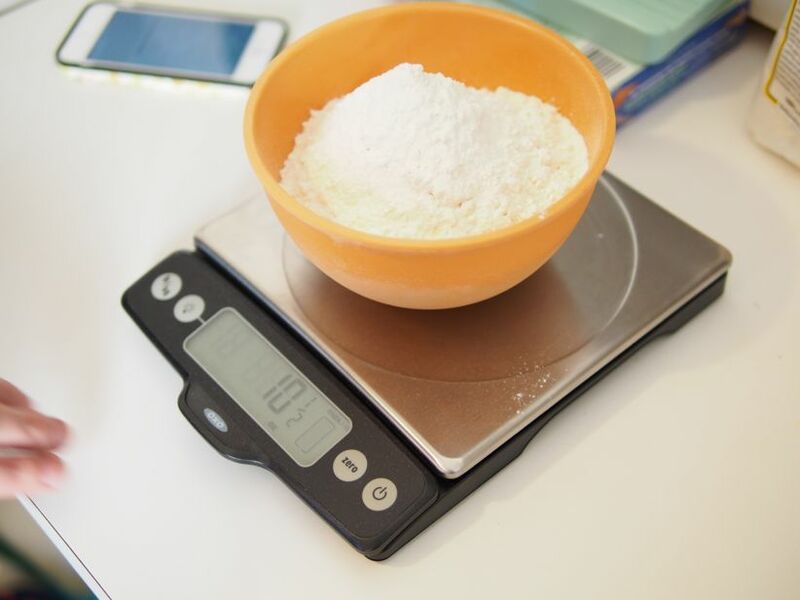 Measure your flour, salt, and baking powder, then combine them in the bowl of your food processor. 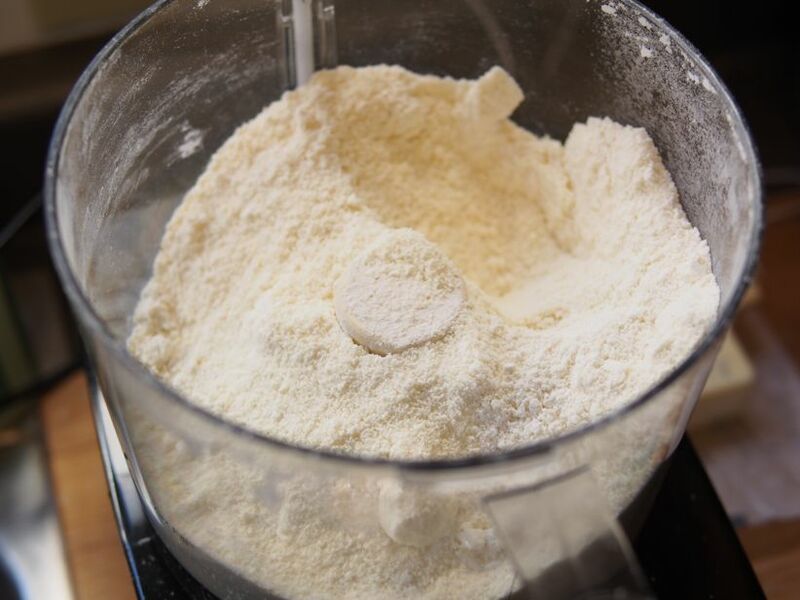 Run the processor for about 10-20 seconds to combine the dry ingredients thoroughly. 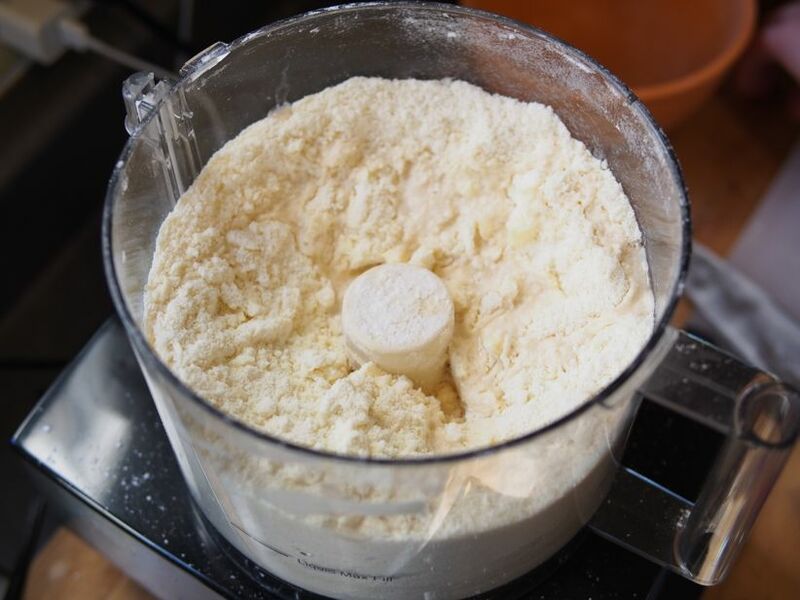 Slice the cream cheese into 3-4 small chunks, and add them to the bowl of the food processor all at once. Close the lid, leave your hand over the spout to keep the processor from bouncing all over the counter, and turn it on. Let the processor run for about 20 seconds. You want the cream cheese to get fully integrated at this point, the the final product will look like damp sand, and you won’t be able to find any cream cheese chunks. You want chunks of butter in the pastry, not chunks of cream cheese. 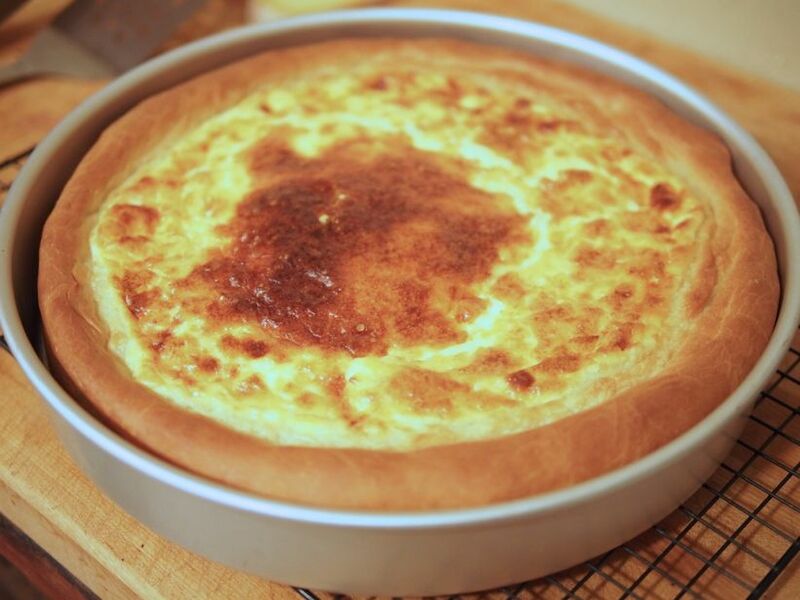 The cream cheese just ups the flavor and fat content of the dough. 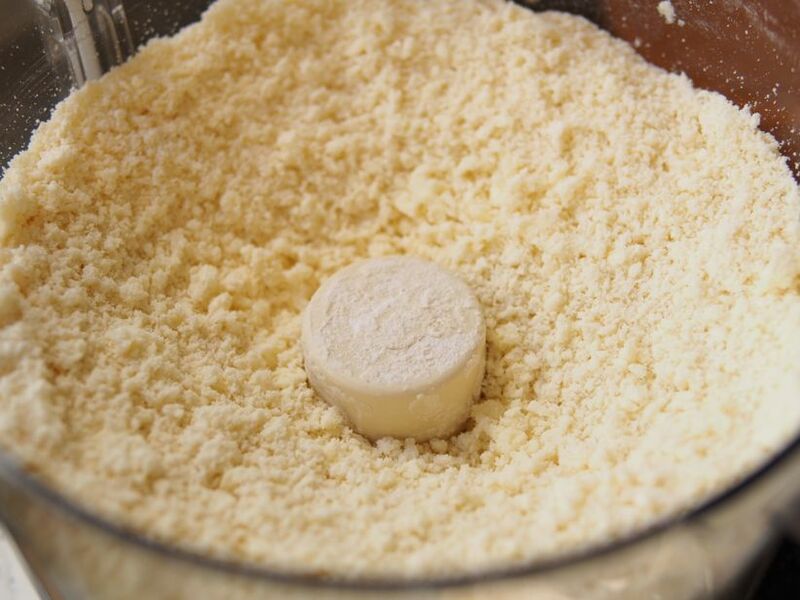 Once the dough looks like it does below, you’re ready to add the butter. See how it looks fluffy, like fresh snow or damp sand? You can’t see any cream cheese, but you know there’s something adding moisture and fat to the flour mixture, which is exactly what you want. 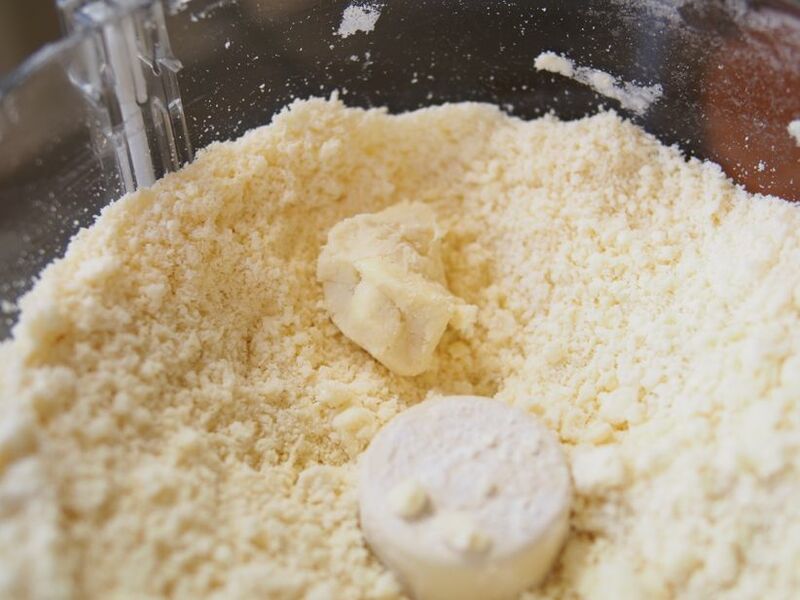 Next, add the frozen chunks of butter to the food processor. Generally, I add about 2/3 of the butter, pulse for about two seconds, then add the second batch. From here, you’ll want to pulse it somewhere between 10-20 times or so, total. Start with 5, then take the lid off. Grab a fork, and toss the mixture around a little. Does it look like there are massive boulders of butter in the bowl? If so, you’re not done yet. Pulse again 5 more times, and toss. Keep going until the pieces you can see are, as Beranbaum says, the size of peanuts. Below, we are about at the peanut stage. You don’t want to over mix, so go gently and carefully along, a few pulses at a time, tossing and checking. Once you get to the stage here, with the butter peanuts, it’s time to add the liquid. Take the lid off the processor, and add in the heavy cream and the cider vinegar. Pulse a few times (say, 3-5) to combine. Toss with the fork and check to make sure all the liquid is integrated. Scrape down the sides and the corner edge of the food processor bowl, because liquid can collect there. Give it 1-2 more pulses, and you’re done. That’s it! What? It doesn’t look like pie crust? It looks more like crumble topping? I know, I know. This is where the magic happens. Take a small chunk of the crumbly mixture in your hand, and squeeze. Does it hold together in a ball, like play-doh? If it crumbles apart, you should run the processor for 1-2 more pulses and check again. If it still won’t hold, add a half tablespoon more heavy cream and pulse 1-2 more times. Once it will hold together, you know you’re golden. It should look like this. Since the recipe we just made is for a double crust pie, you’ll need to divide the dough into two separate ziploc bags. I am a fanatic, and I weigh the contents. This dough will come out to around 21-22oz, so approximately 11 oz per bag is where you want to be. 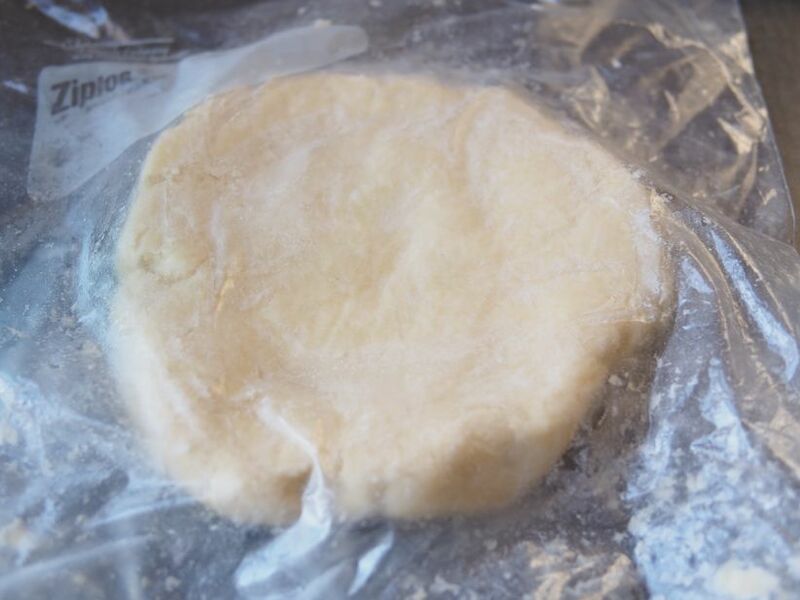 Dump your portioned crust into the ziploc bag, and start kneading – hands on the outside of the bag, dough on the inside. Use your palms and knuckles for this job. You’re incorporating the moisture further, and also developing gluten, which will help it hold together and become flexible and workable when rolling. It will take about 2-3 minutes of kneading to get the dough to form into a ball, and you’ll be surprised and impressed when that bag of crumbs turns into a disk, almost as if by accident. Once you can make a ball with the dough, you will want to flatten it into a workable disk. You can then take the disk, wrap it in plastic wrap, put it back in the ziploc bag, and store it in the freezer for several months. Or, since Thanksgiving is in a few days, just throw this bag into the refrigerator and pull it out 15 minutes before you need to start rolling your crust. Did I answer your questions? Are you now a newly competent and confident baker? Do you have other worries? Let me know in the comments! These delicious little birds are a fantastic Thanksgiving alternative for those who don’t have the time, space or appetite for a whole turkey. They take just an hour or two from start to finish and make the perfect serving size. This recipe will serve 2­-4 people, depending on how hungry you are. I like to cut the finished birds in half, down the middle, and serve 1⁄2 per person… but I could easily eat a whole one. 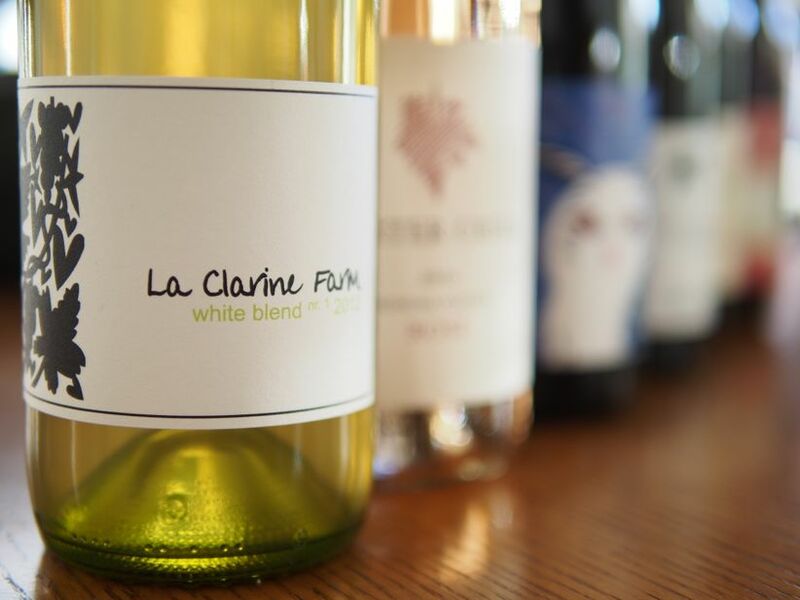 We recommend pairing these delicious little birds with a bright and fresh Pinot Noir like the Verse Carneros Pinot Noir, or a full-bodied white wine with acidity and herbal notes such as our La Clarine White Blend No. 1. 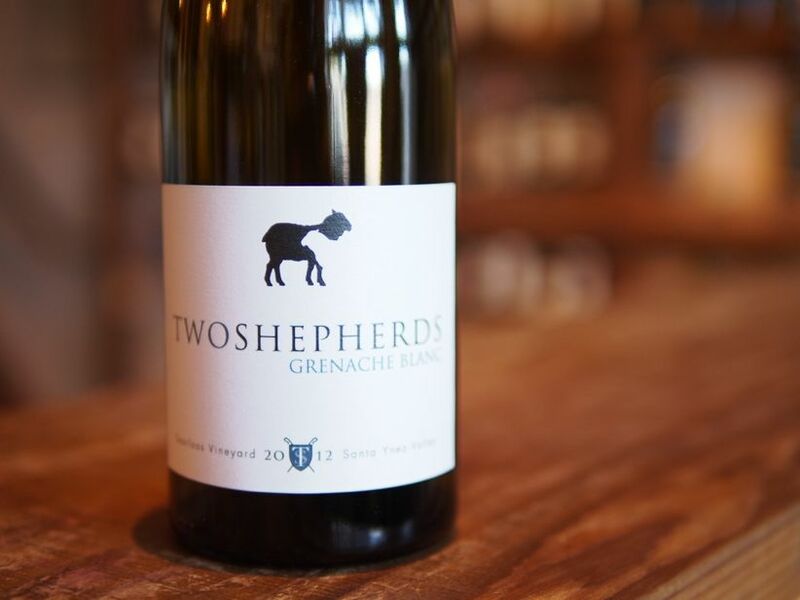 Both of these wines are offered in our Fall wine club lineup. 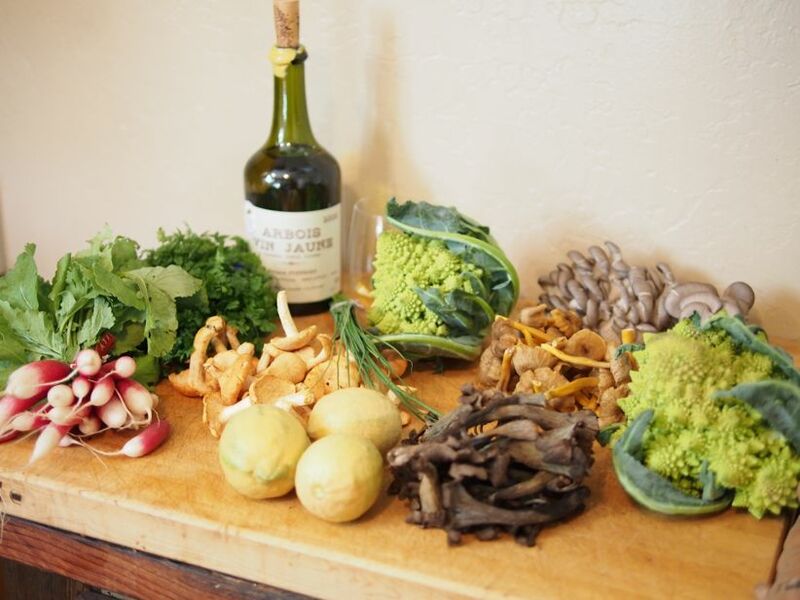 If you want to create a complete meal, you could serve these guys with our Raw Kale Harvest Salad and Savory Chanterelle & Gruyere Bread Pudding. 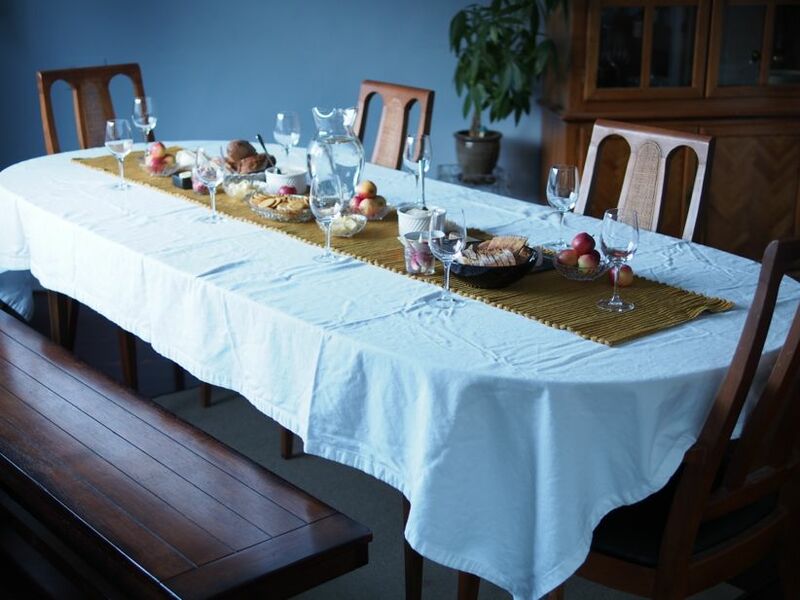 All of these dishes are amazing together and would be sure to impress your Thanksgiving guests! 2 Cornish Game Hens, about 1 or 1.5 lb. each. Pre­heat your oven to 400 degrees. 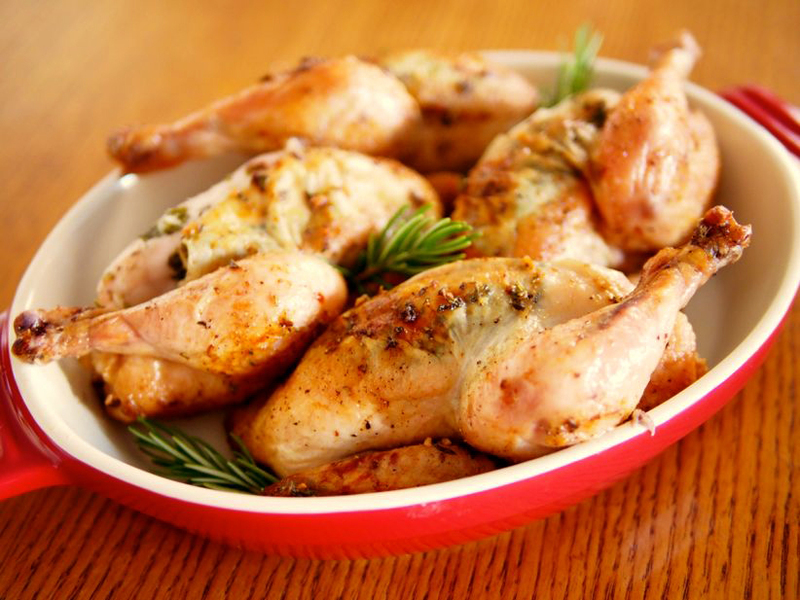 Rinse cornish hens and pat dry with a paper towel, inside and out. Salt the cavity of the bird liberally with sea or kosher salt. 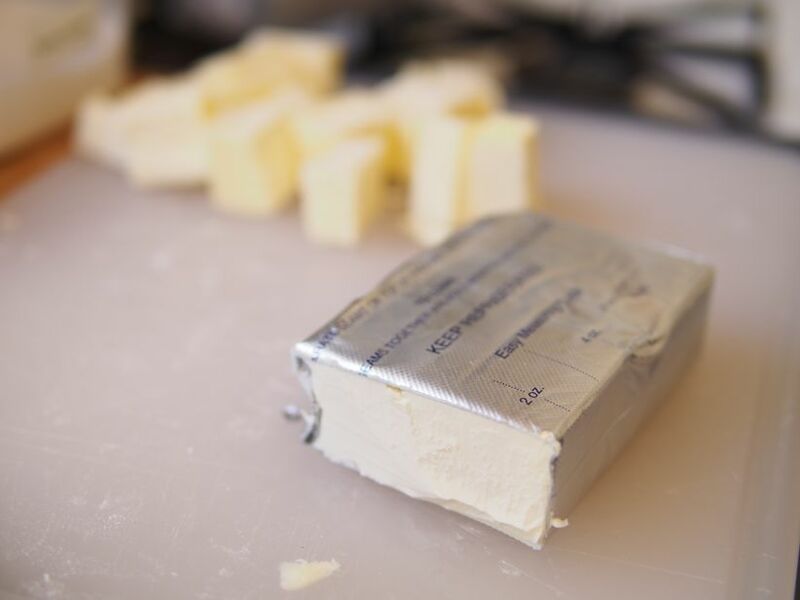 Make the compound butter by fork­-mashing the butter with the chopped herbs, garlic and salt. Run your forefinger between the hen’s breast meat and the skin (making a pocket), then stuff some compound butter under skin. Distribute it evenly under the skin and over the breast meat by patting it down from the outside. Do not put butter on the outside of the bird, as it will prevent the skin from crisping in the oven. Truss your hens with butcher’s twine. This makes the birds more compact, and they will cook more evenly. Trussing also makes for a more visually appealing finished product. Click here for instructions on trussing. Salt & pepper the outside of the hens. Heat a large oven­-proof skillet over medium-­high heat. Add 2 tbsp. olive oil & heat until the oil shimmers. Once hot, place the birds breast-­side up on the skillet. Brown the bottom of the birds and the sides of the birds, but NOT the breast of the birds. This should only take a few minutes. Once the sides and bottoms of your hens are crispy and brown, pop the whole skillet into your hot oven. Roast for 40 minutes to an hour, depending on the size of your hens. Baste the birds with the pan juices every 15 minutes or so. Your birds are finished when a meat thermometer inserted into the dark meat reads 165 degrees and the skin is brown and crispy. Let rest for 5-­10 minutes. Butterfly and separate into halves with poultry shears or serve them whole with a sprig of thyme as a garnish. I like to serve them with a little side of dijon mustard. I love a well-balanced salad. A great mixed green salad is nice, but to me, a salad is best with a few different elements – some crunch, something sweet, a couple different types of greens, and a dressing that brings it all together. I think most people are used to cooking kale, but treated well, you can eat kale raw, and it’s super nutritious. The trick is really letting it sit with the lemon juice for a few minutes. You want to break down the cells of the kale, and the lemon juice acts as a tenderizer. 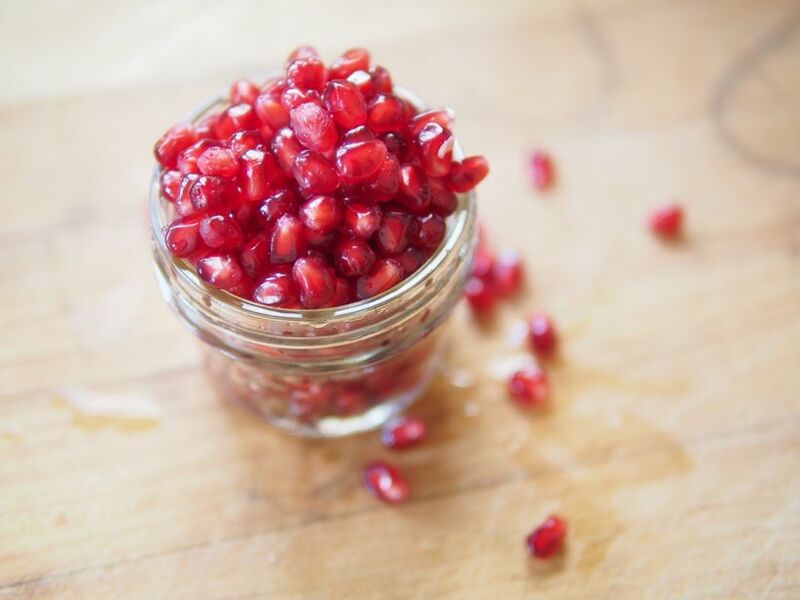 This recipe is very adaptable – you can use a different bitter green than radicchio, or a different sweet, fruity element than pomegranate seeds. Just keep the basic integrity the same – some kale, a bitter element, a nut, a fruit, and a tangy-sweet dressing – and you’ll be golden. 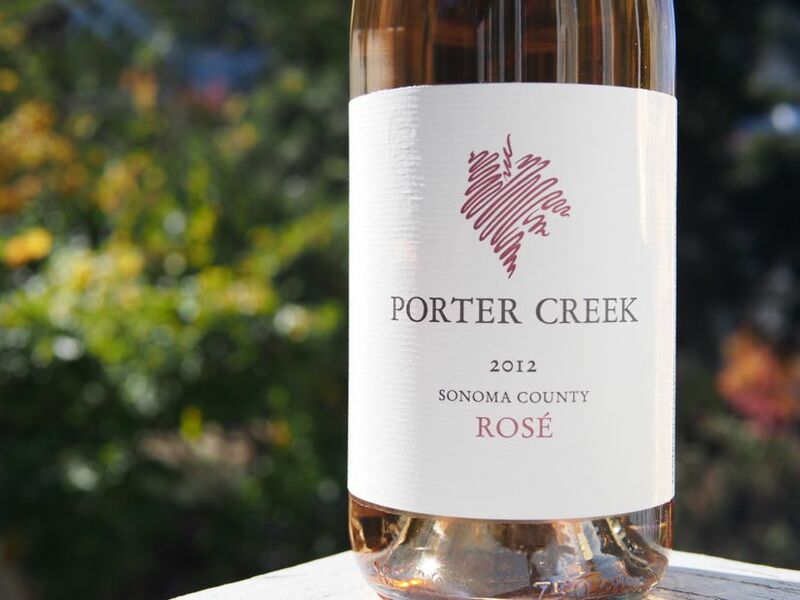 We paired this salad with the 2012 Porter Creek Rose, which was included in our recent wine shipment. I think there are many options for pairings here, but any tangy, acidic, lean wine will be best. Sauvignon Blanc would be another good option. Remove the stems from the kale leaves, then stack them on top of each other into manageable bunches, and slice crosswise into ribbons, about ¼” thick. Quarter the radicchio half and cut the tough stem ends out, then slice crosswise to match the kale ribbons. Set aside. 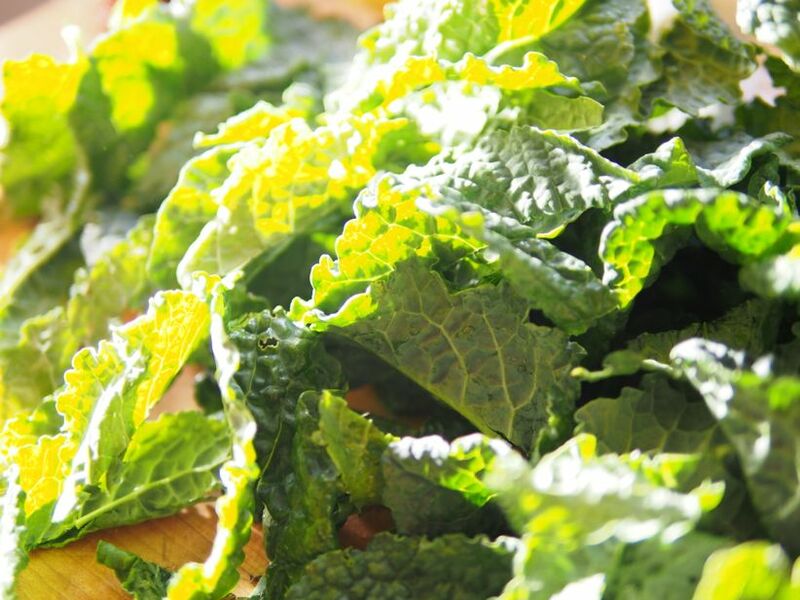 In a medium bowl, toss the kale ribbons, and add the lemon juice, a healthy pinch of salt, and a drizzle of olive oil. Mix well with your hands, bruising the leaves with a moderate amount of pressure. You don’t want to crush them, but you are trying to break down the fibers a little, to make the kale more tender. Set aside. In the jar, combine a few tablespoons of olive oil, the sherry vinegar, honey, and about ½ tsp each of salt and pepper. Shake well. Taste the dressing and adjust the seasonings as needed. 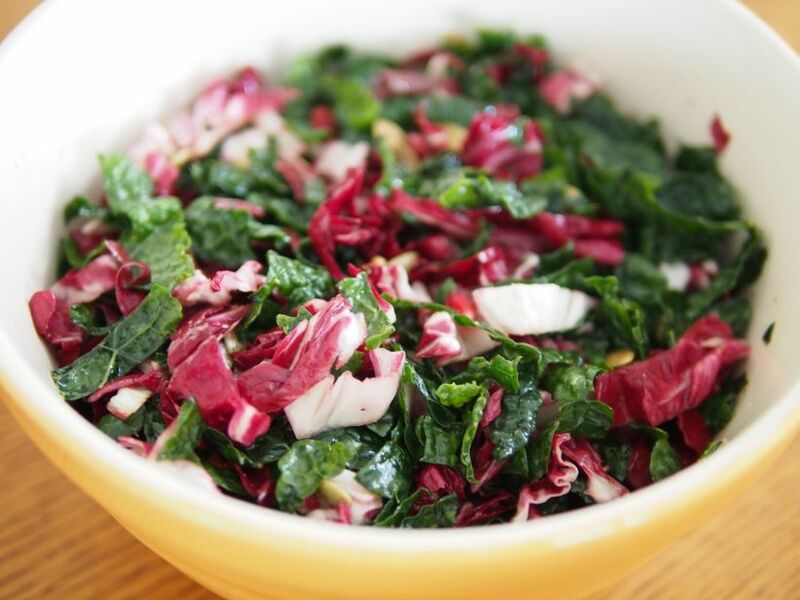 In a serving bowl, combine the bruised kale, radicchio, pomegranate pips, and pumpkin seeds. Pour the dressing over everything, and toss well. 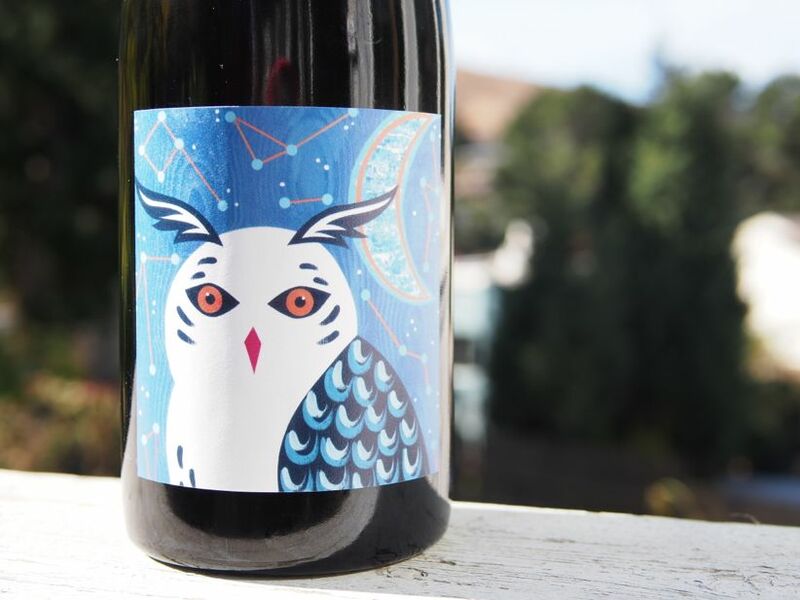 Once upon a time, my husband surprised me with a wine club subscription for Robert Sinskey Vineyards. 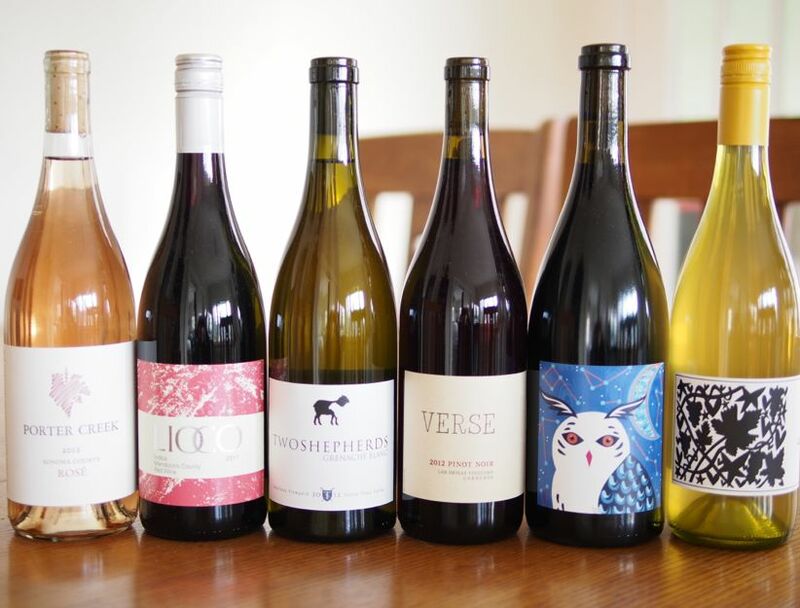 They were the first local Organic/BioDynamic winery I ever fell in love with and he wanted to surprise me for my birthday by purchasing me a subscription to their wine club. This was way before I really got into wine, and I learned so much from the experience. 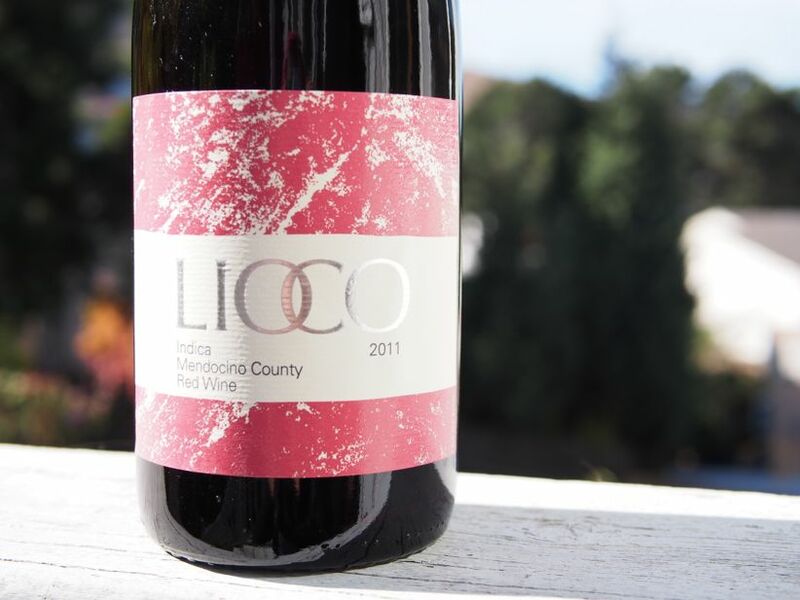 I honestly think that wine club is what opened the doors to the wine world for me. 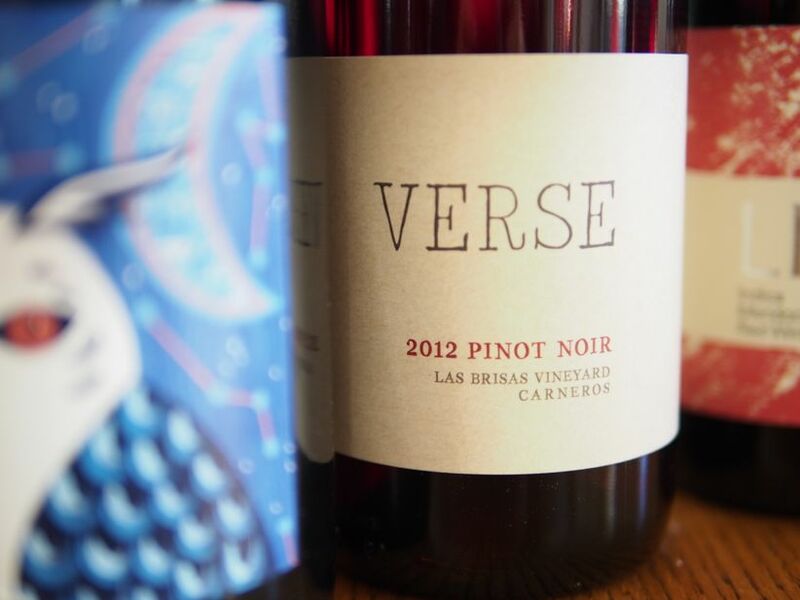 The RSV proprietor’s wife, Maria Sinskey, is somewhat of a dynamo in the kitchen, and with each club shipment came some of her delicious recipes. If you’ve ever been in their tasting room, you will remember the gougeres that come with each tasting flight. This is the recipe for those gougeres, but made in a popover pan. 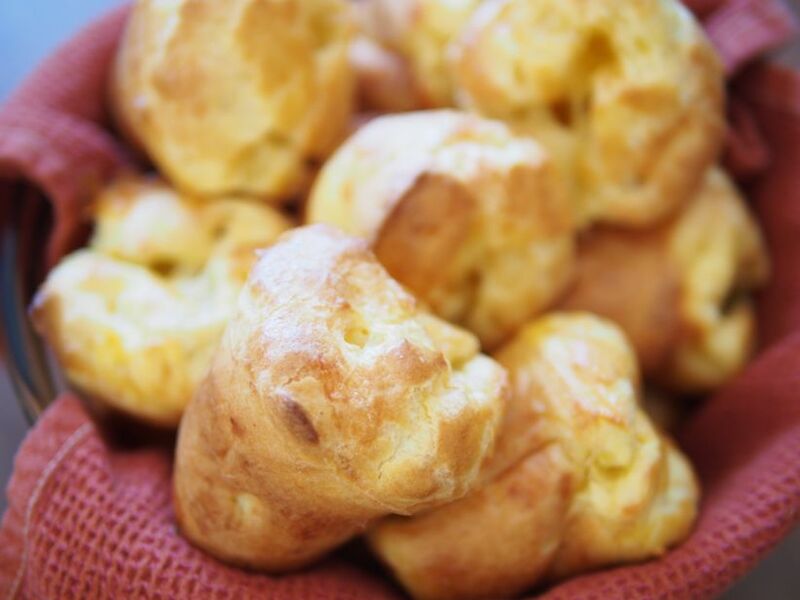 I changed the recipe a little – just the type of cheese used in the gougere batter. 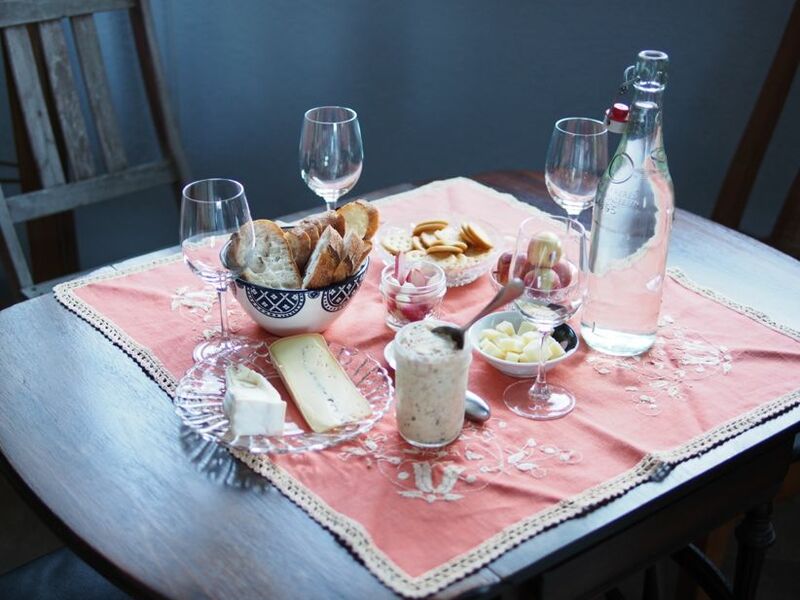 I prepared this recipe for a Chardonnay wine tasting I was hosting, but wanted to use a more regional cheese than cheddar. You see, raclette pairs beautifully with Jura blanc, and I was pouring a Jacques Puffeney Chardonnay from Arbois. Raclette and Jura blanc are a match made in heaven. I love this recipe because instead of tiny little gougeres, it produces huge and fluffy gougeres in the shape of a popover. They are crispy on the outside and airy on the inside, with that distinctive, eggy, chewy gougere-ness. 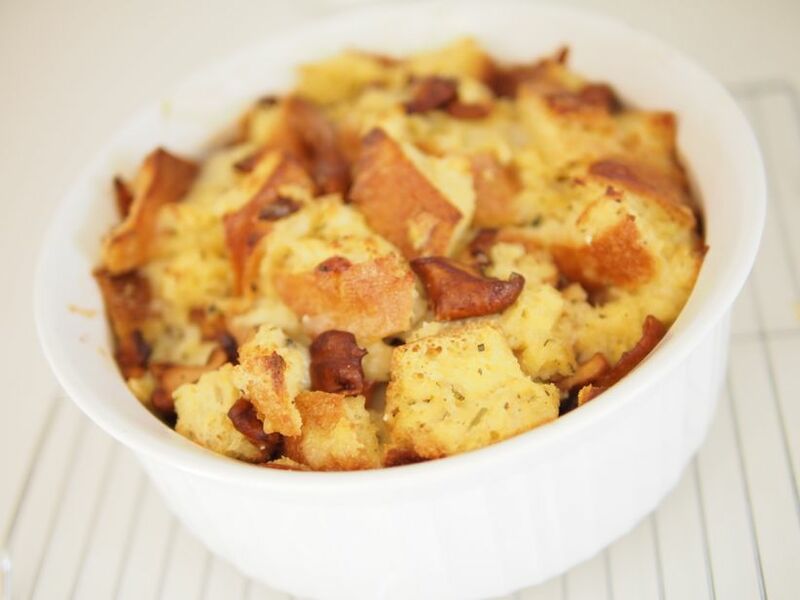 These are great as a side dish at a dinner party or just as an appetizer. 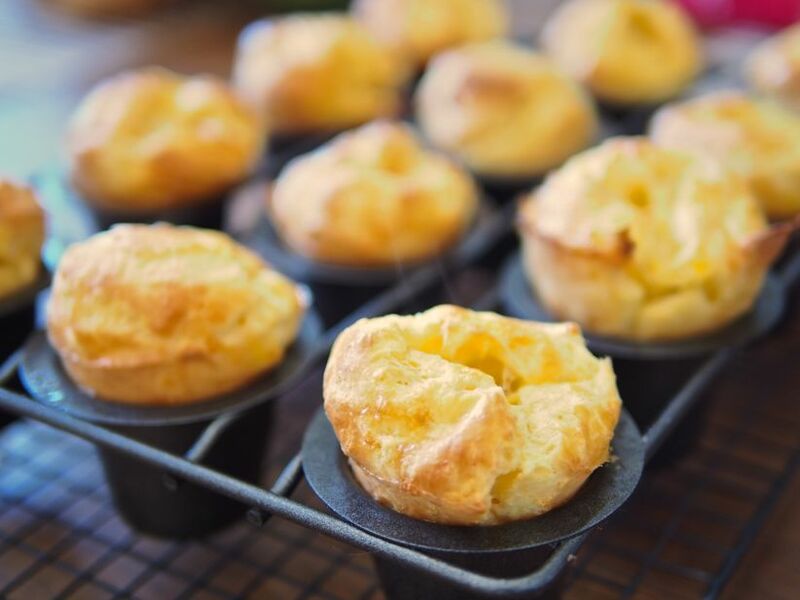 If you don’t have a popover pan, you can make little gougeres on a cookie sheet, but just be sure to adjust the baking time and temperature so you don’t over-cook them. I haven’t tried to make them this way so I can’t tell you how long or at what temperature, but if you bake at all (like Colleen!) I am sure you can figure it out.